The County's segment of the newly-renamed John Warner (nee Meadowcreek) Parkway opened on January 6, and with it the multi-use trail between Melbourne and Rio Road. The 10-foot-wide paved path runs the entire length of the Parkway, and is fully accessible and suitable for pedestrians and bicyclists. The RTF has begun to reopen the original trail alignment, with the segment from just north of Melbourne to the railroad culvert having been the subject of a recent work party. The southernmost leg of the segment, just north of the Park Street bridge, is still closed, necessitating a short road walk along Melbourne and then a few hundred feet down the parkway trail. The culvert beneath the railroad tracks also remains closed, but we are hopeful of obtaining permission to build a new walkway. Meadow Creek, one of the City's major waterways, has been selected to undergo a major stream restoration in 2012. The restoration will result in improved water quality, as well as enhanced aquatic habitat and aesthetic values, along the stream between the Norfolk Southern railway at the east end of Greenbrier Park, and Hydraulic Road. To prepare for this project, the segment of the Rivanna Trail just north of Hydraulic Road has been shifted to the east. We anticipate this will allow the trail will remain open during the project, but be alert for equipment and temporary closures. To find out more details and to follow the progress of this project, visit the project web site at www.charlottesville.org/meadowcreek. A strong turnout for the November 12, 2011, trail work party - bolstered by volunteers from Madison House, Alpha Phi Omega service fraternity, and local cub scouts - blazed an entirely new segment of the Rivanna Trail loop, connecting Stribling Avenue and Sunset Avenue. This connection replaces what had been one of the longest road walks on the Trail, and is possible thanks to an easement from Stribling Holding LLC. We have some photographs posted here. 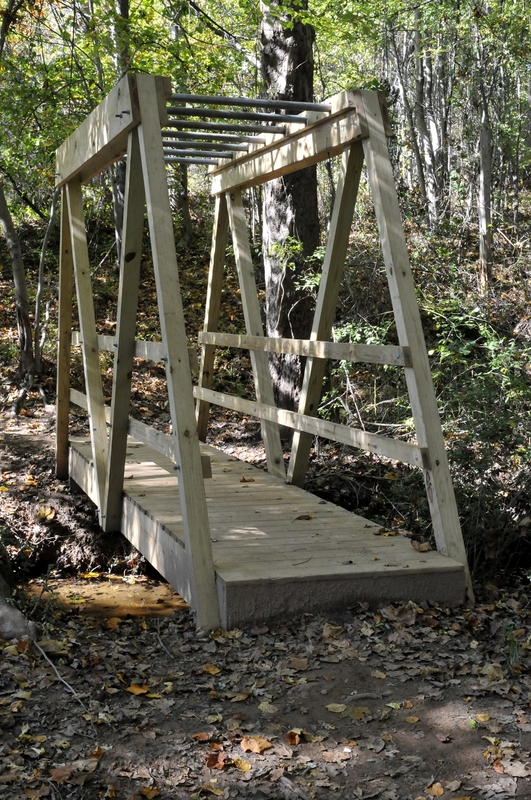 With apologies for the delay in getting photographs posted to the web site, here are some shots of a new bridge on the trail, this one built by the Class of 2011 at the Village School. Inviting all to do a little monkey bar workout, the bridge was constructed in late spring. Located on the trail segment that runs between Barracks Road and Leonard Sandridge Drive, the new span connects the main trail with a spur that runs behind the Law School. Many thanks to the Village School! 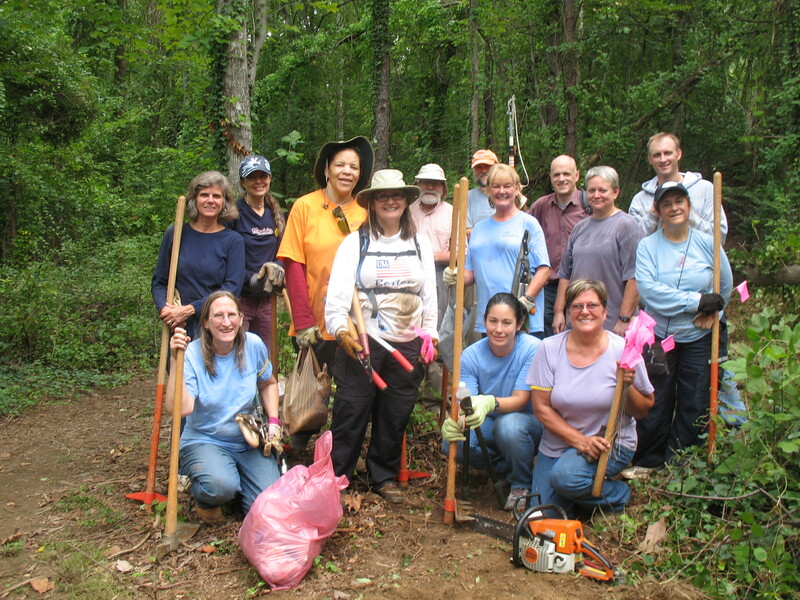 Thanks to a contingent of over 30 UVa employees who donated their time and effort as part of the annual United Way Day of Caring, a quarter-mile section of the trail just north of Hydraulic Road has been moved eastward to make way for the Meadow Creek restoration project that is scheduled to begin in December. Led by Chris Gensic, the Parks and Trails Planner for the City of Charlottesville, the volunteers spent the morning cutting trees, relocating bridges, clearing brush, and even avoiding a nest or two of wasps. The October 8 RTF work party finished the job, and the new route is now complete. Check our photo album for photos of the new trail. Help inaugurate the new segment (and pack the soil) by coming out for a hike! 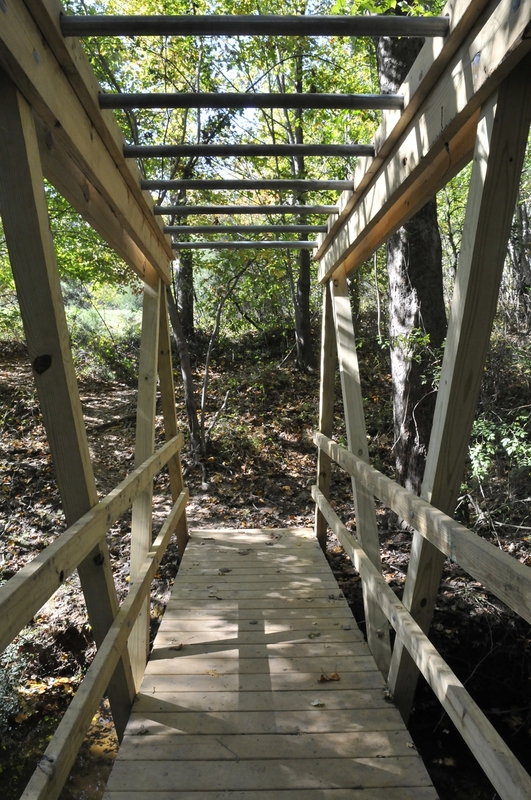 The River North segment of the Rivanna Trail has two new bridges, thanks to the effort of Ben Cosgro. As an Eagle Project for Boy Scout Troop 241, Ben built two bridges behind the soccer fields in Dunlora, one 23' long and the other 30'. Work on the bridges was finished this past May. A gift from the RTF helped pay for supplies and material, with the time and labor provided by Ben. 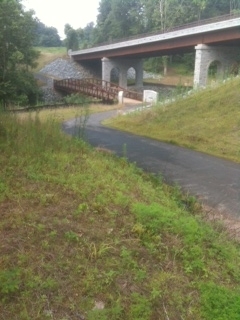 The new bridges are a great example of how volunteers and member contributions make the Rivanna Trails ever better. Thank you, Ben! If you can read this post, it's because the new RTF web site is now live! We hope the new look makes it easier to find information on exploring the Rivanna Trail and supporting the RTF. Behind the scenes, we also have a new database that will help us better manage membership records and track donations. We think we've got all the new pages linked and functioning correctly, but please drop me a line at rivannatrails@gmail.com if something is missing or not working properly. Check out this link to Tom Daly's terrific time-lapse video composed of still shots taken every three minutes during his 8 hour circumnavigation of the Rivanna Trail: www.tomdalyphotography.com/2011/03/rivanna-trail. We invite everyone to share your photos of our trails. Contact us at rivannatrails@gmail.com to tell us what you'd like to post. "Albemarle County is working to connect this portion of the trail with land which has been proffered by both State Farm and Martha Jefferson. The hope is this will eventually be turned into the “Old Mills Trail.” County staff is pursing various grants and non-traditional funding streams to work towards this final goal. Additionally, the County is looking to develop this trail further upstream, with the long range goal of having the trail reach the Lewis & Clark Exploratory Center, and potentially even continuing substantially further north. The PCAC hopes to work with the County to help in this endeavor. There are a number of groups the PCAC would like to bring together to facilitate the success of this project. The hope is that a grassroots effort can help the realization of this trail as well as its continued maintenance. Interested citizens are encouraged to attend PCAC meetings to voice their interest, and to follow the PCAC website for developments on this and other “green” projects." RTF is launching a major new initiative to expand our trail network West from Charlottesville along the route of the old Three Notched Road. Our goal is to create a scenic and safe walking and biking route from the Rivanna River near Monticello to the Blue Ridge Mountains following the path of the historic Three Notched Road. Originally conceived by a small group of community members, this project has become the second major RTF initiative to expand our trail network outside of the existing loop trail. Our work on the Three Notched Trail (TNT) is at a very early stage. We have begun planning a route. We hope that the first phase of the trail will begin in the vicinity of University Hall, skirt the athletic stadium to reach Old Ivy Rd., follow the railroad tracks and Ivy Road west from Bellair Market, cross the Health Sciences Northridge property, join a stretch of the original Three Notched Road behind the Christian Aid Mission, then follow either Rt. 250 West or Old Ballard Rd west from Broomley Road, and eventually reach West Leigh Drive. To find out more information about this exciting project, download our brochure (pdf).